Fox’s upcoming X-Men drama The Gifted is a Marvel story as old as time. People with powers walk among us, those without powers fear them, and the government is seemingly hell-bent on capturing and imprisoning all of the... well, the gifted. Last night, Bryan Singer, who’s directing the first episode of the series, took to Instagram to post a behind-the-scenes production photo of Polaris (Emma Dumont) trapped in some sort of plastic encasement. In and of itself, the photo doesn’t give much away about Polaris’ story arc throughout the show, but the visual does give us some sense of the trouble she’s likely to get into. The prison uniform that she’s wearing suggests that she’s been captured by whichever shadowy governmental organization that the Druckers (Stephen Moyer and Amy Acker) are trying to protect their children from. Also, as alarming as it is to see someone being vacuum sealed, the photo does bring to mind the plastic prison that Magneto spent time in during the second X-Men movie, which would make sense given that Polaris’ powers are magnetism-based. 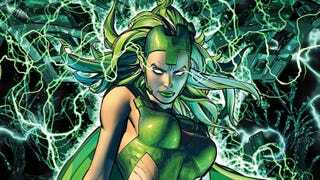 Unfortunately, we still don’t know whether this version of Polaris will be related to Magneto the way she is in the comics and, even more distressing, we don’t know whether Fox plans to give her her iconic head of emerald locks. We can only hope that the show’s costume designers saw how the internet dragged the Inhumans’ Medusa for her terrible wig and is now planning accordingly.